To do Alternating V-Ups, lie flat on your back with your legs out straight in front of you and your arms down by your sides. 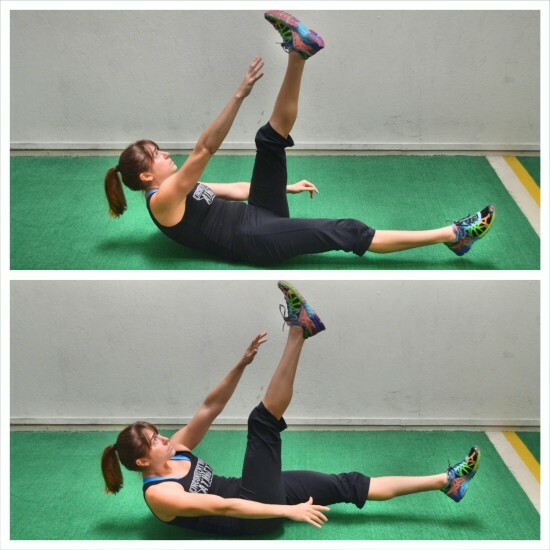 Lift one leg up toward the ceiling and then lift your other leg up off the ground, squeezing your glute. Press your low back into the ground and engage your abs as you lift your legs up. Then crunch your upper body up as you reach your opposite arm up toward the toes of your raised leg. Press lightly through your arm on the ground as you press your low back into the ground and reach up as high as you can, rotating toward that raised leg. Squeeze your glute of the leg close to the ground to help protect your low back. Do not touch that leg down on the ground. Keep it up higher to make the move easier. Then lower the raised leg as you lift the other leg up toward the ceiling and crunch up to reach up toward that opposite foot. Keep alternating sides. Make sure to keep your low back firmly pressed into the ground as you reach up as high as possible while keeping your legs as straight as possible. Beginners may need to touch one leg down to the ground instead of keeping it up off the ground. They may also need to bend their knees more. Move quickly, crunching up as high as you can.